Finding satisfying breakfast choices can be a challenge for gluten-free vegans, as so many standard breakfast foods are based not only on animal products, but also on gluten-containing grains (pancakes, bagels, toast, baked goods in general, hot and cold cereals, and such). Here are some suitable homemade options. A good use of leftover cooked brown rice, this makes a great breakfast (and a nice side dish or snack as well). Toast nuts/seeds in a dry skillet until they just begin to color. Add remaining ingredients and cook, stirring continuously for 2 to 3 minutes, until heated through and creamy. This recipe for sweetened beans comes from Peru. It’s a porridge that more resembles sweet, thick milk then beans. Puree kidney beans using either the fine blade of a food mill, or a food processor or blender. If using a blender, you may need to add a little of the rice milk to obtain a smooth puree. In a saucepan, combine bean puree, rice milk and sweetener. Simmer gently until thickened. Sprinkle each serving with sesame seeds. Tiny tender pancakes that are a morning delicacy topped with fruit butter or fruit-juice-sweetened preserves. Mash tofu with a fork. Stir in maple syrup, nut butter, cinnamon, flour, and baking powder. Mix with your hands until evenly blended. Heat just enough oil to cover the surface of a skillet or griddle. Using about 2 tablespoons tofu mixture, shape into small plump cakes about 1½ inches round. Place in hot pan and cook about 3 minutes on each side, until nicely browned. Top each cake with a dollop of fruit butter or preserves and serve. Although this recipe takes some time to prepare, it can be made in advance and easily reheated in a frying pan or moderate oven. Serve plain or with ketchup. Heat oil in a skillet and sauté onion and green pepper about 5 minutes, until softened and onion is just beginning to color. Add potatoes and tempeh. Combine soy sauce and water and after hash has been cooking for about 5 minutes, add a spoonful of the liquid. Continue to cook over medium heat for 20 to 30 minutes, until potatoes are just tender. Stir frequently, lifting with a spatula and loosening any food that sticks to the pan. Add more soy sauce mixture as needed to keep moist. When potatoes are cooked, add any remaining soy sauce mixture and cook 5 minutes longer, pressing hash down with a spatula to mash lightly. 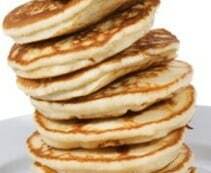 Very tender pancakes that are so flavorful you can even eat them plain. For pancakes with a varied texture, add ¼ cup chopped nuts. Mix dry ingredients in a bowl. Add water, sweetener and almond butter, and stir gently until flour is thoroughly moistened and almond butter evenly distributed. Fold in banana. Pour batter by ¼ cupfuls onto a hot, well-oiled griddle or skillet. Cook until bottom is brown and a spatula slips easily underneath. Turn and brown other side. This is a delicate cheese with a light caramel color. It has a slightly sweet flavor and none of the beany taste of tofu. Bring milk just to a boil. Add lemon juice or vinegar and cook gently for 5 minutes, until curds separate and liquid portion is clear. Remove from heat and pour through a strainer lined with cheesecloth or a coffee filter. Let drain thoroughly. Use at once or chill. These gluten-free crispy rice cookies keep well in a covered container and make a good breakfast on-the-run. Beat tahini and sweetener together in a mixing bowl until smooth. Stir in remaining ingredients. Using a teaspoonful at a time, shape mixture into balls and place on an oiled baking sheet. Flatten slightly using a fork or your hand. Bake 12 to 15 minutes, until edges of cookies are golden. Transfer to a wire rack to cool. A very tender loaf of gluten-free banana bread with great flavor. Combine dry ingredients, including nuts, in a mixing bowl. Add banana, nondairy milk, tahini and oil. Stir gently until ingredients are completely moistened and batter is evenly mixed. Pour into an oiled 8-inch loaf pan and bake 45 to 50 minutes, until golden. See the entire listing of VegKitchen’s gluten-free vegan recipes. One of our favorite GF breakfasts is very simple – sweet potatoes roasted whole, then mashed, topped with a light sprinkling of walnuts, pecans, or hazelnuts. The problem with much of vegan recipes is too much sugar. People kid themselves using maple or agave syrup, but it’s still sugar. My barber who is vegan, knows that I’m striving (not perfect) to eat vegan. She gives me recipes that are full of sugar. I know for the PETA members here this won’t go over well, but sugar can be worse than animal fat. Rick, It’s OK to cut down on the sugar in recipes. If you’re baking, you may need to increase one of the other dry ingredients or cut down on one of the wet ones, but with a little experimentation, all that will change is the sweetness. I seldom find a recipe anywhere that doesn’t have too much sugar for my taste and have to adapt them. Yike, the degree symbol in the word doc translated to another zero in WordPress. Thanks for your eagle eye, it has been fixed! In the sweet tofu cakes, do you use silken tofu or firm tofu? The pancakes sound delish! Hi Kelly, since this is a contributed recipe I can’t say for sure. It should have been specified, of course. I would say that either silken tofu or firm would work (as long as they’re very well drained. Enjoy! Tried the RiceFlourPancakes this morning. They were really good. Followed the recipe as state except that we just mashed the banana before adding to the recipe. Even the non-vegans in the house came back looking for more!